There are sincronicities in our life and when it appears in my life I am following it. The workshop Awakening the Illuminated Heart is one of the exemple of how quick and easy can be if you are on your way. In the context of the information about Training workshop for Awakening the Illuminated Heart Teacher I asked a question if it is for me to attend it. I have to mention that I did not attended the old MerKaBa workshop. And 2 days before the Michelle Pacheco�? ?s December 2011 workshop Awakening the Illuminated Heart to start, I heard about it, I registered and attended the workshop, having full cooperation of my husband. In the last year I tried twice to attend the old MerKaBa workshop and every time something happened and I could not attend it. Now I know why. So I received an Yes answer. I am economist as profession. I graduaded in 1976 in Bucharest the Academy of Economic Studies, Finance University. In 1997 I graduaded the 2 years Program for Business Education at University of Washington USA Executive M.B.A.- administered in Bucharest (ASEBUSS). I am chartered accountant, finance auditor, tax consultant being registered with the respective professional bodies in Romania. In 2008 I attended the Silva healing course with Mr. Sam Silva and I am practicing it with my family. In the same year I started to study and practice the Bach flower remedies for emotional balance. Since October 2011 I am registered with the Bach Foundation International Register. Since 2008 I use the Bach flower remedies treatment for myself, my family and friends. 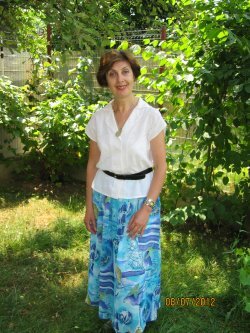 Together with my husband we are living in a house with a small garden very close to the center of Bucharest city, in an quite and green zone. We both are at pension and we have a very small business now with only one client, giving accounting assistance. We are injoing to have a part of nature in our garden, and I thank to the trees, flowers and vegetables to be there for us. I am blessed to have my parents around us, with some health problem but on their legs. I have a sister and two nephews. The youngest one made me to look for something to help him and I found a book about Indigo children and there I read about Bach remedies. I looked on internet about Bach remedies and I was very happy to find that in the same week will be a class for the first level. I called and I registered to that class. My husband supported me during the class and after. This course gave me the happiness to find a non invasive and very friendly way to bring our emotional state in balance. The quick and easy way to attend this course confirmed me that I was on the right way. So my nephew helped me to go on my way and I thank him a lot. The workshop Awakening the Illuminated Heart is another exemple of how quick and easy can be if you are on your way. 2 days before Michelle Pacheco�? ?s December 2011 workshop to start, I heard about it, I registered and attended the workshop, having full cooperation of my husband. One year before I tried twice to attend the old MerKaBa workshop and every time something happened and I could not attend it. Now I know why.